At age 60, Lori can bicycle up challenging hills well ahead of most adult men less than half her age. You probably wouldn’t know it from looking at her. She is a bit shorter than average, with a womanly figure. You might pass her in the mall and have no clue of the powerhouse that she is, but if you look a moment longer, you will get a sense of her radiating health and strength. I met Lori a few years ago when I was training for a triathlon. She offered to help me with my cycling skills and stamina. I accepted because she was so friendly, not knowing yet that she had so much to offer in expertise. Lori, like most of us, enjoyed her bicycles while growing up, riding around with her brother and friends. 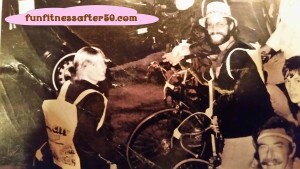 It was not until she was about 18 years old that she and her boyfriend at the time bought bikes. Soon after that, she went on her first long ride, a memorable 113 miles from Long Beach to San Diego in one day. She couldn’t move the next day! For a while after that, her cycling consisted mainly of riding to college every day, a 20 mile round trip. When she married a fellow she met in Long Beach, she and he would go on some bike rides, but he was not as passionate about it as she was. She began riding with more intensity after her kids were a bit older. Mountain biking was the emphasis at first, because that was the kind of bike she had. She went mountain biking every day except Sunday for 8 years. 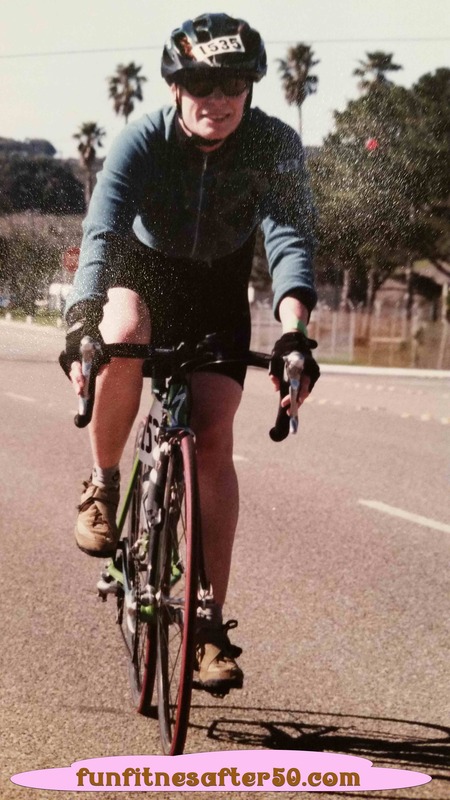 When her uncle and cousin Andy asked her to ride the Solvang Century (in cyclist’s language, a “century” is a hundred miles) in 1998, she ended up riding a tandem bike with her cousin. She didn’t know anyone else who rode regularly until about 2000, when she was on the side of the road with a flat tire. It happened that another lady cyclist was passing by and offered help. The new acquaintance, Nancy, turned out to be a racer of considerable experience. 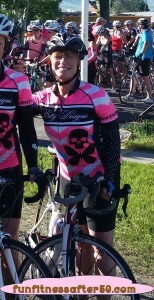 Lori says Nancy was the most influential person in helping her improve in riding a road bike. Another friend, Sue, who used to be the 26th ranked woman cyclist in the nation, was most instrumental in teaching Lori hill climbing techniques … when they were both around 50 years old. Some of Lori’s experience with hills comes from living in Lake Arrowhead, California for 3 years. Here, hills combined with altitude provided training opportunities hard to come by in many places. Later, she lived in Yucaipa for 2 years, which did not have the same elevation, but had plenty of outdoor space. In all, Lori has ridden in about 15 century events, including the Little Red century in Utah; the Tour of Heber, also in Utah; and the Goldilocks in Idaho. In 2016, just shy of her 60th birthday, she rode her fastest century ever at an average pace of 17.1 miles per hour, doing much of the pulling for her group of four. “Pulling” in the bicycle world is what the lead cyclist does by cutting the air first, providing less resistance for those riding behind. The others in her group were aged 38, 52, and 52. Another type of cycling event Lori likes is the week long trip. She has participated in three, women’s only, week long tours. They typically ride 60 miles a day, then spend the night in hotels. She calls these “fun rides,” since they are not timed and emphasize the social and sight-seeing. I asked Lori how she motivates herself to keep riding. She quickly answered “by remembering how good it feels both to be riding and to feel healthy afterward.” She also added with a smile, that new equipment or clothing help, too. Beyond that, she suggests finding activities you like and small groups you like to do things with. In some ways it helps to be older. There are fewer responsibilities and more flexible time, which often translates into more financial freedom. 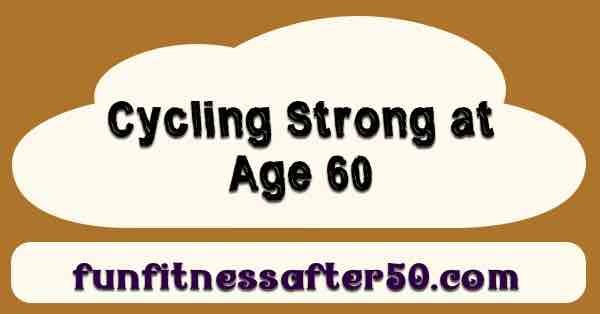 Being older brings with it the wisdom of experience in many areas, such as how much training it really takes to reach goals. This can help to avoid over-training and unnecessary stress. 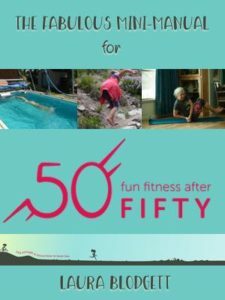 One doesn’t reach the age of 60 without a few set-backs, and Lori has had her share. She has had abdominal surgery, knee repair three times (skiing accident), cracked ribs (there was a loose dog involved), and dangerous harassment from drivers. 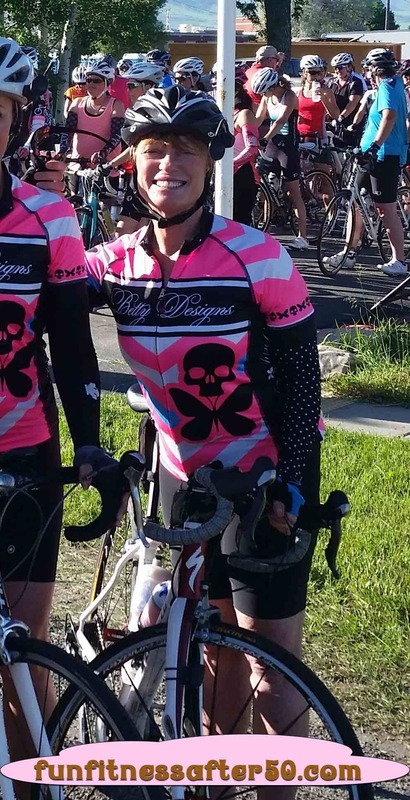 Three of her cycling friends have been killed by impatient drivers since 2010. A main goal of hers is to keep moving and to avoid physical stagnation. She says this lets her have more fun and makes her more fun to be around. Because cycling is weather dependent and is not a weight-bearing exercise, she also enjoys yoga, walking her dogs, and sometimes a bootcamp class at the gym. There is one cyclist that Lori has never been able to pass while riding her bike. There is a man named Lou whom she last rode with in California when he was 64 years old. He is in 70’s now and is still an inspiration to her. She keeps all of these people in mind as she plans for another week long tour in 2017, this time in Colorado. She wants to continue cycling as long as she can, always getting better, maybe dazzling a few people along the way. I know she has inspired me.